With the advent of a new person in our lives, we have had to do some room reshuffling, and My Sewing Room – being the smallest in the house – will become the new person’s room. This means the larger spare room – currently the Entertainment Room and His Study – will now become the Guest Room, Entertainment Room, His Study and My Sewing Room. It is about one and a half times as large as my erstwhile sewing room and, in that space, will have to undertake multiple duties! We’re not too fussed about making sure New Person’s Room is ready prior to her arrival. We don’t intend that she’ll be occupying it for quite a while yet, and l doubt very much that she’ll care what it looks like. And even if she does, it’s going to take her a long while to communicate that to us. Prior to shifting my sewing stuff out, Partner reorganised the garage, to accommodate stuff from His Study (mostly our camping gear, actually), and the study, in order to make room for my sewing stuff. He then shifted my stuff in. In effect, I’m going from spreading my stuff all over one room and two tables, to one table and half a wardrobe. 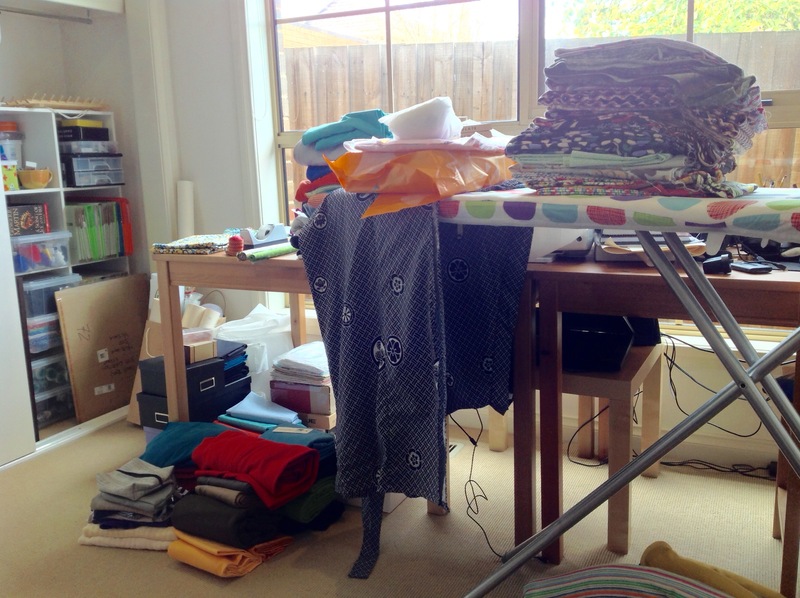 While I don’t have a lot of stuff, and my sewing space has always been reasonably well organised; it had not been especially compact, because there was no need for it to be. Now, there is a need! My usual reorganisation strategy is to simply dive in, move stuff around and work out what works, setting off to get what I need when I realise I need it. Given my restrictions, and the fact that I want to keep the ‘study’ (we really need to come up with a name for this room!) fairly tidy as I go, that strategy is not going to work. I had to craft a plan. Preferably a cunning plan. First, I thought long and hard about what I had. 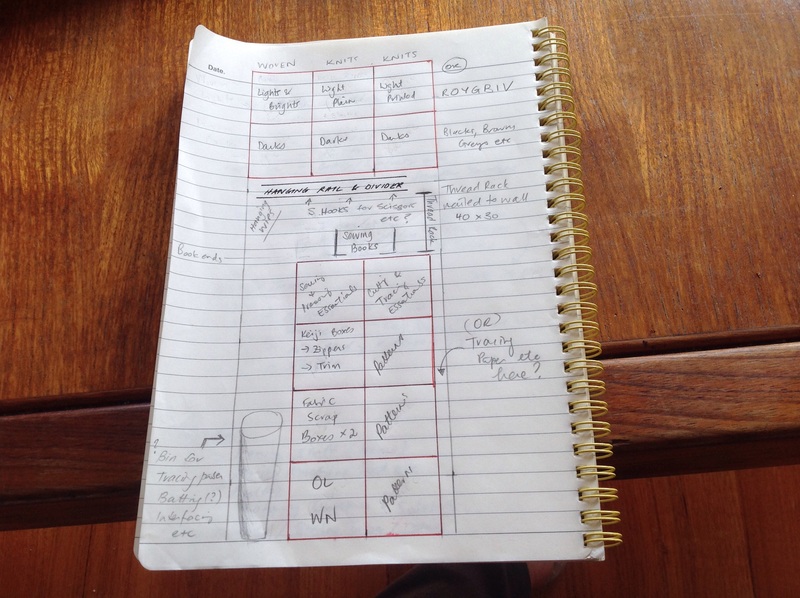 I wandered into the study and stared at my piles of stuff and made lists. I’ve been resisting the lure of fabric for a while now, to try to rationalise my stash somewhat. It helped that pregnancy hormones sucked up my energy and sewing mojo. I do have almost twice as much knit fabric, than woven, and I have lots of reasonably sized scraps that are not quite large enough for even a top, but too large to simply discard. They might be good sizes for this new person entering our lives, who has proven to be so disruptive already! Buttons, already boxed but might need a bigger box. Uh oh. Elastics, including Fold Over Elastic, to be boxed, maybe with the bias binding and ribbons? Other craft bits and bobs (origami, calligraphy, glass cutting), some of which are boxed; some of which are just … around the place. Second, I measured the wardrobe space and spent plenty of minutes just staring at it, trying to work out what would be the best way of using it to store my stuff. I then drew the wardrobe space. Good thing it is pretty much just a rectangle, because my drawing skills leave much to be desired. Like almost everyone else in the sewing world, I thought cubic shelves would be the best way to keep everything. I must admit that I’ve coveted cubic shelving for a long time, but it didn’t seem necessary when I had a wardrobe and a bookshelf. I ruled out the IKEA Expedit/Kallax shelves because IKEA is simply too annoying to go to. We only go there for Ivar shelves, because that’s the entirety of our furniture pretty much. Instead, we got some cubic shelving from Bunnings, which is a mere one kilometre from our house and just much less annoying to go to. The cubes are a bit smaller than the Expedit/Kallax cubes, but that works well inside our wardrobe. We have some of the Bunnings cubic shelving already, so I could go look at it to see what configurations I though would best house all that stuff up there. I’ve been inspired by The Fabulous Dr E’s recent blogposts to outline my organisation process. I probably won’t be as thorough, however. Nice to see I have inspired you. Incredibly key to my re-org is getting rid of stuff I don’t love. Especially fabric I don’t love! Good luck with your room! I’m loving your detailed posts! They really help me with thinking through my own reorganisation. How about “mummy & daddy’s play room”? Possibly “the hobby room”. In moments of great need it may become “the quiet & alone room”..
A couch is a handy thing in a baby room, can you keep it there? Hoping the pregnancy continues in a straightforward way. Too many words 🙂 I suspect it will be perpetually inaccurately called The Study. We shall see. Thank you; belly is progressing well. Phew! Good luck with everything, hoping you are well and the sewing mojo comes back at some stage! Thanks, Anne! The sewing mojo is going to come back when this new person arrives, I just know it. And then I will want to make everything but will probably be unable to. I hear newborn babies leave you with plenty of time on your hands. Ha! I made so many things in the run up to the girls’ arrivals, not much afterwards for a while!! You need all the sleep you can get! You’re doing a much better job of sorting out your new sewing space than I am. You have an actual plan! With a proper list! All I have is a vague idea of just seeing where everything might fit. I’m grateful to you for the tip on the cubic shelves at Bunnings – that looks like it could be ideal for my vague sewing/studying area. Best of luck with your shuffling! I’m looking forward to seeing how it all turns out. Either the couch will stay in there, because we won’t get around to moving it … or there is an armchair earmarked for the room. We shall see what the room needs, and deal with it as it arises. We live in the middle of a big city; it’s not hard to find stuff! I’m always surprised by the sheer panic about ‘getting the nursery ready’ and the pressure of buying stuff, like change tables! Surely I can change her on any table, with a towel or similar cushioning underneath? Or the floor, provided my knees let me. I simply do not understand the requirement for a specific piece of furniture. Baby Bunting and its kind won’t be getting much money from me! The only thing I’m spending a lot of time thinking about is a hiking baby carrier 🙂 but we probably won’t buy one until we go on a walk! Getting ready for your first baby is daunting, but exciting. I was so with you in the “surely I don’t need all this stuff? ?” category. There is so. Much. Unnecessary. Stuff. Having said that, I did find a change table very useful, mostly for the storage capacities, and because I had a bit of a dodgy back (thank you child birth) for a while and couldn’t bend all that successfully. Our first babe came early so the nursery was way off finished. I don’t think he noticed. Looking forward to following your progress. The nursery is definitely not going to be done before this baby arrives!